The Johns Hopkins-AstraZeneca Scholars Program (formerly known as Johns Hopkins-MedImmune Scholars Program) is a first-of-its-kind Ph.D. training program jointly implemented by the Johns Hopkins University’s Center for Innovation in Graduate Biomedical Education and AstraZeneca, the global research-based biopharmaceutical company. Students in this program will be mentored by a pair of co-supervisors, one at Johns Hopkins and the other at AstraZeneca. In addition to the standard Johns Hopkins course curriculum and Ph.D. thesis project, students will be introduced to the process and challenges of drug discovery and development through coursework in translational research as well as lab work conducted at AstraZeneca under the direction of AstraZeneca co-supervisors. This unique approach to training will offer graduate students hands-on experience in the biomedical field and prepare them for careers in the biopharma industry, while still obtaining a traditional Ph.D. from a world-class university. Click on each name for more information. Graduate students enrolled in Ph.D.-granting programs (entering 2016 or later) at any of the schools of the Johns Hopkins University are eligible to apply for the program as long as co-supervisors can be identified with an agreeable joint Ph.D. thesis project plan. In order to minimize the upfront burden of paperwork, the application process for the Johns Hopkins-AstraZeneca Scholars Program is intentionally kept informal at the early phase. The key question at this phase is whether joint Ph.D. thesis plans can be developed by students and co-supervisors. Dr. Takashi Tsukamoto, Program Director, will facilitate this process by working closely with potential students and co-supervisors. Once agreeable plans are established, the process enters more formal steps including in-depth review of the applications by the Johns Hopkins AstraZeneca Joint Committee for final decision. In addition to courses required by the home graduate program, Johns Hopkins-AstraZeneca Scholars must complete the three courses listed below on translational research. These courses are offered by Johns Hopkins Drug Discovery and are designed to cover various topics on drug discovery and development to complement the basic science courses offered by the home graduate programs. If you are interested but undecided on whether to apply for the Johns Hopkins-AstraZeneca Scholars Program, it may be beneficial to start taking these courses as electives in your graduate program to avoid excessive course load in the later years. The Johns Hopkins-AstraZeneca Scholars Program encourages students with disabilities to apply for the program. Johns Hopkins University is committed to providing reasonable and appropriate accommodations to students with disabilities. Students with documented disabilities should contact the coordinator listed on the Disability Accommodations page. If you are a graduate student and interested in becoming a Johns Hopkins-AstraZeneca Scholar, the first step is to contact Dr. Tsukamoto, who will guide you through the process of exploring the feasibility of being selected for the program. If you are a Johns Hopkins principal investigator affiliated with a Ph.D.-granting program and are interested in learning more about potential opportunities to work with AstraZeneca investigators through this program for future graduate students, Dr. Tsukamoto can serve as a point person to facilitate the communication with the AstraZeneca counterpart. 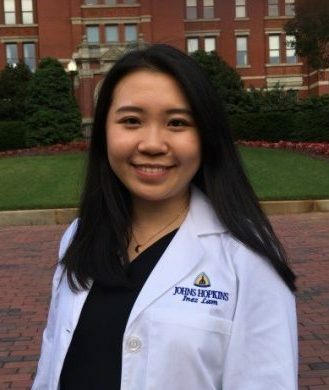 Inez Lam is a Biomedical Engineering PhD student at the School of Medicine and the Whiting School of Engineering. 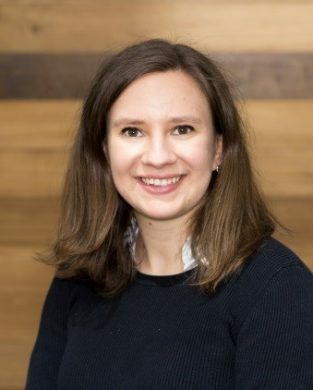 She is building multiscale computational models to better understand the mechanisms of antibody-drug conjugates and how they work in the body under the co-mentorship of Dr. Feilim Mac Gabhann at Johns Hopkins and Dr. Rosalin Arends at AstraZeneca. Natalia Majewska is a Chemical & Biomolecular Engineering PhD student at the Whiting School of Engineering. She is studying the factors influencing glycosylation of biotherapeutics and developing strategies to better control them under the co-mentorship of Dr. Michael Betenbaugh at Johns Hopkins and Dr. Nitin Agarwal at AstraZeneca. 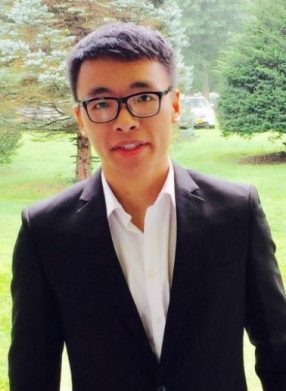 Vincent (Chenxu) Guo is a Biological Chemistry PhD student at the School of Medicine. He is investigating the relationships between exosomes, endogenous retroviruses, immunosuppression, and cancer under the co-mentorship of Dr. Stephen Gould at Johns Hopkins and Dr. Scott Hammond at AstraZeneca. 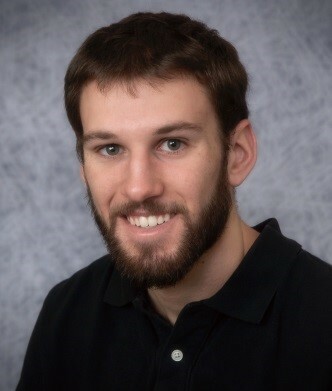 Derek VanDyke is a Chemical & Biomolecular Engineering PhD student at the Whiting School of Engineering. He is engineering a novel protein scaffold that can be used to target and degrade disease-associated intracellular proteins under the co-mentorship of Dr. Jamie Spangler at Johns Hopkins and Dr. Changshou Gao at AstraZeneca. Since 2009, the Johns Hopkins Drug Discovery program has provided the Johns Hopkins community with core expertise in drug discovery research including medicinal chemistry, screening assay development, drug metabolism and pharmacokinetics, and animal pharmacology/toxicology. The Johns Hopkins Drug Discovery Program, located in Baltimore, MD, works with the researchers across Johns Hopkins to research and develop tomorrow’s therapeutics for a wide range of human disorders.